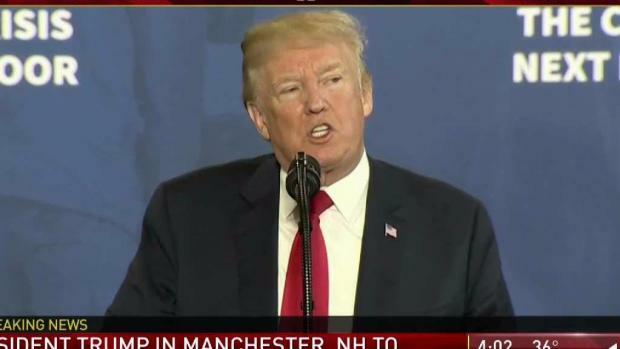 President Donald Trump unveiled his plan to combat the country's opioid crisis Monday afternoon in New Hampshire. 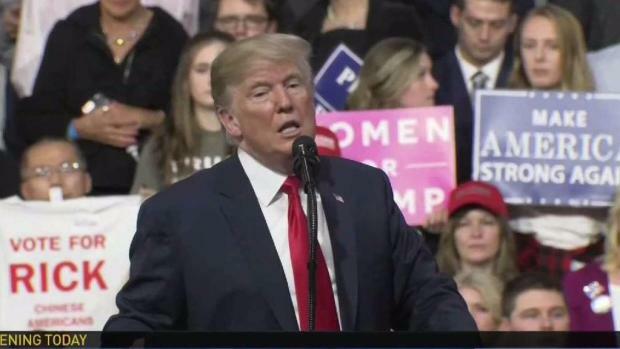 Trump, who was accompanied by first lady Melania Trump, addressed a crowd at Manchester Community College. "It's great to be back in the beautiful state of New Hampshire," Trump said. "I don't know if you remember, but this is the first place I came for the primaries you had. And this is the room right here, so I like this room." The president's plan to combat opioid drug addiction calls for stiffer penalties for drug traffickers, including the death penalty where it's appropriate under the current law. Plenty of those opposed to Donald Trump made their voices heard when he spoke in New Hampshire about the opioid crisis. 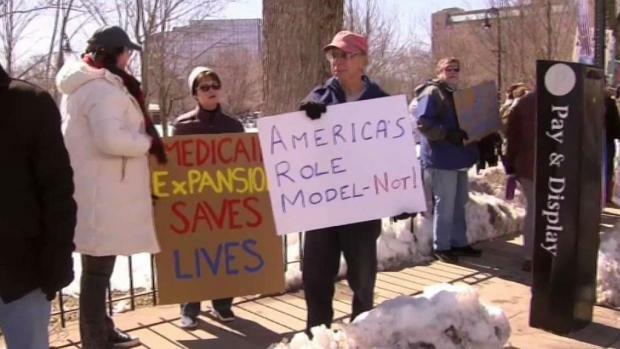 Protesters who gathered in Manchester, many of whom have been affected by the opioid crisis, shouted "We die" and waved signs in the president's direction as his motorcade passed. Many there were urging the president to do more than has been done to help combat the epidemic. "It's been 15 months and not a lot has happened," said John Burns. "I would ask him to take a hard look at what it means to be a drug addict," said Dot Montoya. "I don't think he has a clear perception of what addiction does to people." Both Burns and Montoya are in an opioid addiction recovery program. Ryan Fowler, one of the protest's organizers, says he has been sober for three years. "You can't take a population that's isolated and think you can put them in a cage and make the problem better," he said. 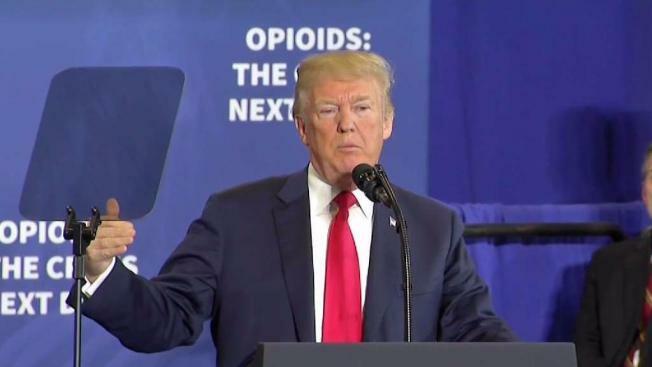 Trump also wants Congress to pass legislation reducing the amount of drugs necessary to trigger mandatory minimum sentences on traffickers who knowingly distribute certain illicit opioids. President Trump Discusses New Plan to Combat Opioid Crisis. "I see what you're going through," Trump told the crowd on Monday. "(It's) about as bad as there is anywhere in the country, and I said I'd be back and we are back, and we're pouring a lot of money and a lot of talent into this horrible problem. We pledged to honor the memory of those you lost with action and determination and resolve. We will not rest until the end, and I will tell you, this scourge of drug addiction in America will stop. In a state hard-hit by the crisis, some have criticized the president for not making the issue a priority as he has promised while others believe he can help. "We have too many drugs up here and he wants to help and I believe that's a possibility for him to do that," said Mark DiCampo of Manchester. Shortly after he took office, Trump was criticized for calling New Hampshire a "drug-infested den" in a phone call with Mexico's president. 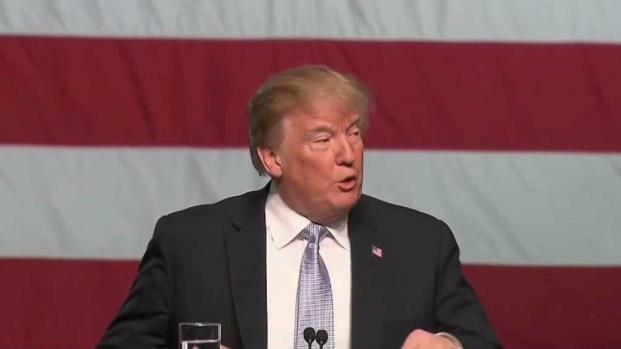 President Donald Trump is scheduled to unveil his plan to combat the country's opioid crisis Monday afternoon in New Hampshire. "He did put us down pretty bad, but it's America and you can say what you want too I guess," said Ronda Murphy of Merrimack. "I think it's a fact. And I don't think that it's just New Hampshire. I think that's a statement that could be made about our places," said Alex Halle of Manchester. Prior to giving his speech, the president and first lady stopped at the Manchester Central Fire station around 2 p.m. They were joined by Gov. Chris Sununu and Mayor Joyce Craig. President Trump hailed the Manchester Fire Department's "Safe Station" program, which helps opioid addicts seek aid without the fear of facing criminal charges. "You save a lot of lives," Trump said, touting the program as a national model. First responders there say the presiden'ts visit was a big moment. "It's overwhelming," said Manchester EMS Officer Chris Hickey, who created the state's first ever Safe Station. "Never did I think in my career that I'd have an influence or an impact that would be worthy of having a sitting president come and address our program." The station allows users to walk in 24 hours a day, get a health assessment and become paired with recovery support. The stop in New Hampshire was Trump's first visit as president. He won the state's 2016 Republican presidential primary but narrowly lost in the general election to Hillary Clinton. It follows a visit to the state last week by retiring Sen. Jeff Flake, R-Ariz., a persistent Trump critic. Flake told New Hampshire Republicans that someone needs to stop Trump — and it could be him if no one else steps up.